Unusual, circa 1880 American carved mahogany cabinet desk executed in the style of Wooten (est. $1,000-$2,000). 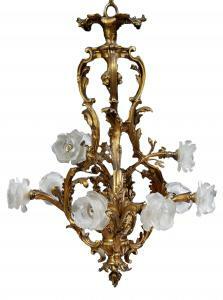 Early 20th century French gilt bronze nine-light chandelier, 35 inches in height and 24 inches in diameter (est. 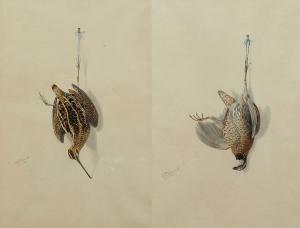 $800-$1,200). An 1880 American carved mahogany cabinet desk made in the style of Wooten and two bird depictions by New Orleans artist George Louis Viavant are two top lots. 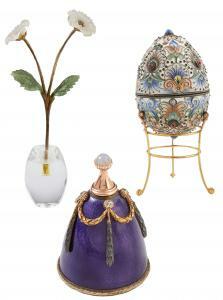 NEW ORLEANS, LA, UNITED STATES, March 13, 2019 /EINPresswire.com/ -- An unusual, 1880 American carved mahogany cabinet desk executed in the style of Wooten, two bird depictions by New Orleans artist George Louis Viavant1 and three wonderful objects by Fabergé are just a few of the expected highlights in Crescent City Auction Gallery’s Important Spring Estates Auction, scheduled for the weekend of March 23rd and 24th. •	A 19th century Louis XV-style carved oak buffet a deux corps (a buffet with two bodies, which split apart, for easy transport and delivery), 90 ¾ inches tall (est. $1,500-$2,500). •	A 19th century Louis XVI-style carved walnut double-door armoire, 106 inches tall by 61 inches wide (est. $1,000-$2,000). 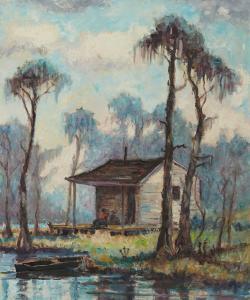 Offerings by other Louisiana artists will feature an oil on board painting by Steele Burden3 (1900-1995), titled Swamp Cabin with Black Figure on the Porch, unsigned, 23 ½ inches by 19 ½ inches (est. $2,500-$3,500); and an oil on artist board by Alberta Kinsey (1875-1952), titled Still Life of Flowers in a White Vase, artist signed and 18 inches by 14 ¼ inches (est. $1,000-$2,000).